Inspector blogging: Back to the floor. A Devon and Cornwall Police Inspector tells it as it is. It was the thought of learning how to use a new piece of kit that was my final hurdle. For some time, and especially since the burble of an Airwaves radio no longer sent a tickle of cortisol to my chest I have been planning my way back to the streets. Or more accurately in the case of patrolling rural Cornwall, the streets and dual carriageways, single tracked grass growing country lanes and footpaths. I had the good fortune to have a "very important meeting" with a colleague I was a Constable with in north Cornwall. She is now the project officer for the new piece of kit I had to get my head round, and I was her local contact or "getting the message out there" for the users of the said piece of kit. After the meeting I got a useful tutorial on the piece of kit, and finally had the confidence to switch from "training mode" to "live mode" and set up my very first "shift". I had become an official user of the Devon and Cornwall MDT, the Mobile Data Terminal. 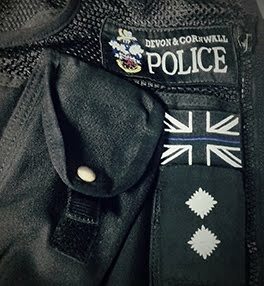 After a quick check with the duty Sergeants in East Cornwall I joined an experienced, very capable and professional officer for a day shift. And I am grateful to them and their team. Hosting a slightly bruised and terribly out of date "boss" is probably not most coppers idea of an ideal shift. Anyhow, with rank badges off I joined them for briefing. In terms of numbers of officers working we were pretty well off. Covering one market town, two small coastal towns, a handful of villages and a bucketful of hamlets and farms we had a Sergeant, three patrol Constables, one Neighbourhood Constable and a Police Community Support Officer. And me. For the first time in the longest time I went through briefing as if I meant it, noting registration numbers and crime numbers, colours and types of vehicles, primary taskings, offender management plans, MISPERS by which I mean missing persons and then recent crimes. My crew mate seemed much more relaxed than me. The first task of the day was to do some door knocking around an address where a suspect for domestic assault was arrested the night before. The partner did not want to give a statement and the children swore blind they had seen nothing; using almost exactly the same words. So at an hour when people were likely to be awake and actually feel inclined to let a copper into their house to take a statement we went door knocking. My first customer was a chatty older lady who invited me into her sitting room and spoke over her loud TV to let me know her daughter could tell me all about it. As is the way, I had to piece that together from a list of first names, explanations of friendships and relationships and graphic descriptions of who did what to whom whilst trying to work out what was hearsay and what she had actually seen, which was nothing at all. We tried again but the victim herself still refused to tell us anything. But my colleague got to have a private word with the kids whilst I talked to the victim. We are doing what we can. After a statement where I passively shared half a pack of cheap cigarettes, fumbled with my plug in keyboard and MDT I admitted ignorance and sought help from the local Constable to download the statement and get it to the officer from the Sexual Offences and Domestic Abuse Interview Team who was "dealing with" the arrested suspect. He was waiting in his cell. Apart from making grammatical and spelling errors that would embarrass an eleven year old, and referring to my colleague as "my daughter" when talking to the witness I did OK.
Then it was to a "silent 999" we thought came from a remote house, which looked more like a mansion when we arrived. It would have worked well as a location for a hammer house of horrors movie. It turns out the owner was very understanding and the 999 call had actually been dialled in the pocket of a bloke at the Eden Project. That is nowhere near the mansion. Go figure. After that my crew mate drove us back though lanes not quite wide enough for our car to a roundabout to keep observations for a suspect car that had been on briefing and was circulated on our radio channel. As an advanced driver who has completed some pretty technical courses I trusted her judgement on the right place be to be. And it was. After spotting a car of the right make, model and colour we followed and stopped it only to find an extremely polite older couple who may never before in their life have spoken to the police. I do hope we left them with a positive customer experience. We parked up again and joked about buses and such, then the actual suspect car drove past. Well that was it. We wiggled around the country lanes to close up on the subject vehicle, no lights or sirens. It took an unnecessary right turn which was pretty much the give away he had seen us. But he hadn't made of yet. So, with traffic light and plenty of places to stop we lit up the blues and twos and indicated for the car to pull over. Guess what happened? Anyway, after the car had sped off we stopped, switched off the lights, siren and applied the handbrake. Lots of cars came to look for him, and one the Neighbourhood Constable very nearly stopped him until the naughty car pushed the police car out of the way. The tinker. And so, after checking if anymore paperwork or forms were needed (Electronic PNB entries, Unifi Crimes to update, Storm logs to update, DASH forms, VIST forms, NCRF forms, use of force forms, Section 9 statements, COMPACT tasks to update, Unify UNIFI custody records, UNIFY Enquiry tasks to update or a bunch of stuff I couldn't remember the name of) I was assured by the Sergeant he would sort out anything I'd forgotten. Gratefully I said my thank yous and went home to walk the dogs. Next time I try some back to the floor training, I will try and remember how to be a Sergeant. PS - there was a crash, someone was assaulted and a thief got away. If only. This blog is not monitored 24 hours. Please do not report police matters to this blog. We do not monitor this blog 24/7. Devon and Cornwall Police. Picture Window theme. Powered by Blogger.